Hi Friends: Here's my first project for the pre-release of this really cute stamp set called Happy Easter Banners Bunny from JessicaLynnOriginal stamps. This set is available for pre-order with free shipping until the release date on 3/4/17. Like the release of the Corgi set, all of the Design Team members are making 3 projects with the set and posting them several times a week until the launch. Today's card uses a flip card die set that I really love! Flip cards are so much fun - I love to work with them! 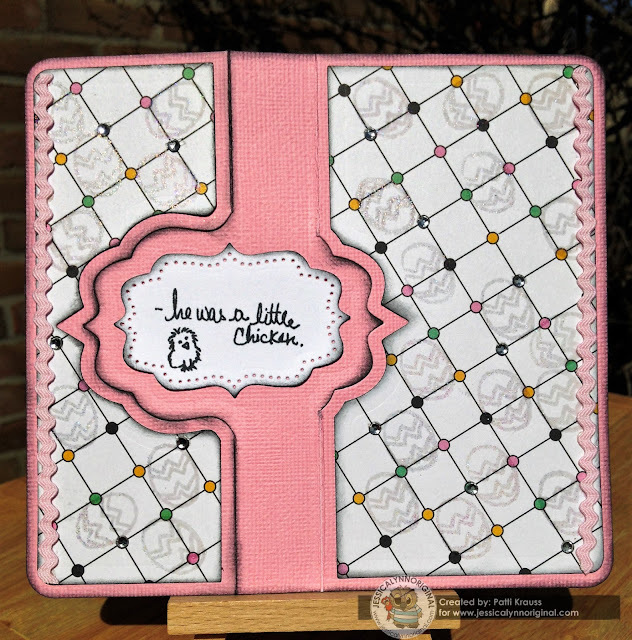 Visit all of my design teammates and see what they've done with this cute stamp set. Don't forget, if you decide to purchase any stamps or digis from the store, please remember to put my name in the instructions/comments section during checkout. Diecut card from pink cardstock and coordinating patterned paper using the Flip-Its die. 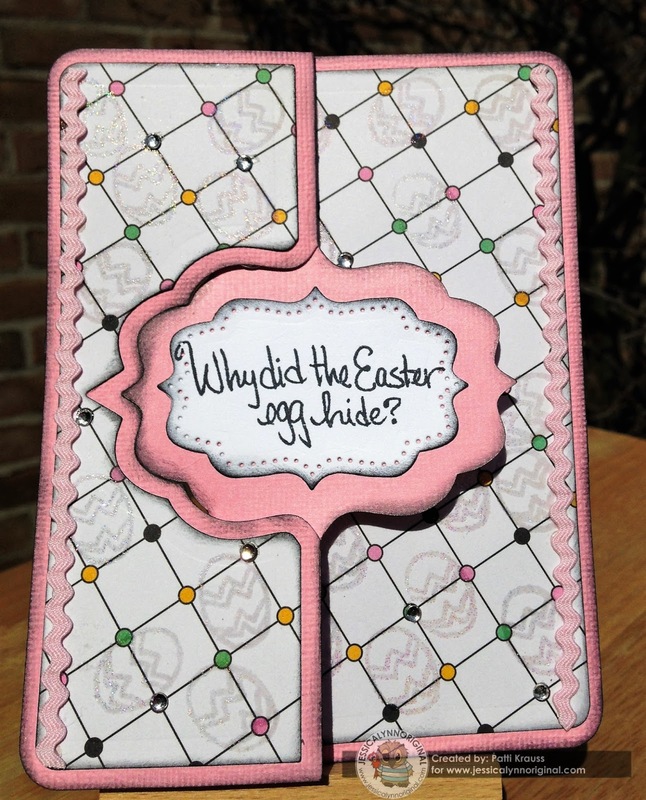 On the patterned paper pieces, stamp the Easter Egg repeatedly with Versamark ink, then use Kaleidoscope embossing powder and a heat tool to emboss the images. This makes the eggs slightly hidden (the sentiment riddle says the Easter Egg was hiding!) Diecut 2 of the sentiment labels from white cardstock and use black ink to stamp the sentiment onto each label - I cut my stamp into 3 pieces so that I could use the components separately, but you could try to mask it off, if you don't like cutting your stamps. (It really does not hurt them in any way.) Stamp the little chicken onto the back label. Ink all edges of the card base, labels, and coordinating pieces, then adhere them to card. Add pink rick-rack ribbon to the sides of the card, then finish with some randomly placed adhesive gems. Now you have a cute little Flip-It riddle to send to someone for Easter. Super ute card! I love the colors. So adorable patti! Love how you broke up the sentiment! Great card! I just love your card, Patti! It's so pretty!